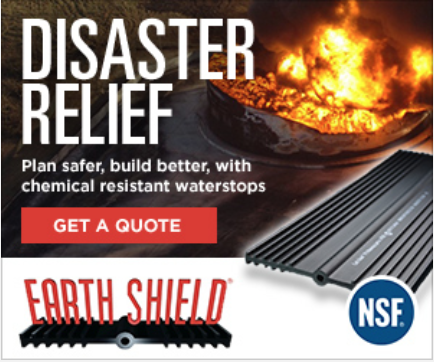 Earth Shield Thermoplastic Vulcanizate Waterstop is used as a fluid-tight diaphragm, embedded in concrete, across and along the joint, for primary and secondary containment structures. 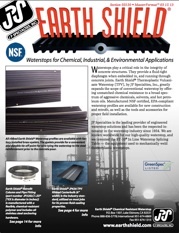 Earth Shield Chemical Resistant Waterstops are resistant to a wide range of oils, solvents, and aggressive chemicals. Alcohol, ketones, glycols, esters, and aqueous solutions of acids, salts, and bases have little effect on Earth Shield Thermoplastic Vulcanizate Waterstop. The superior chemical resistance of Earth Shield Thermoplastic Vulcanizate Waterstop is enhanced by the use of a ribbed centerbulb configuration, which is available in a 4, 6, and 9-inch width. This provides for greater mechanical bonding with the concrete and a barrier against migration of liquid flow around the waterstop. The ribbed centerbulb style also allows for joint movement and may be used in above or below grade applications. Additional shapes are available for retrofit, extreme expansion, stainless steel and base seal applications. Different varieties and grades of thermoplastic elastomers (TPE) are commercially available. On the low-end there is thermoplastic polyolefin (TPO), which has a rubber phase that is not cross-linked. On the high-end there is thermoplastic vulcanizate (TPV)... Earth Shield has chosen a fully cross-linked TPV as our standard elastomer compound, which provides superior mechanical properties, retention, and chemical resistance. In fact, when compared side-by-side, no competitive product is even close to achieving the physical properties of Earth Shield. 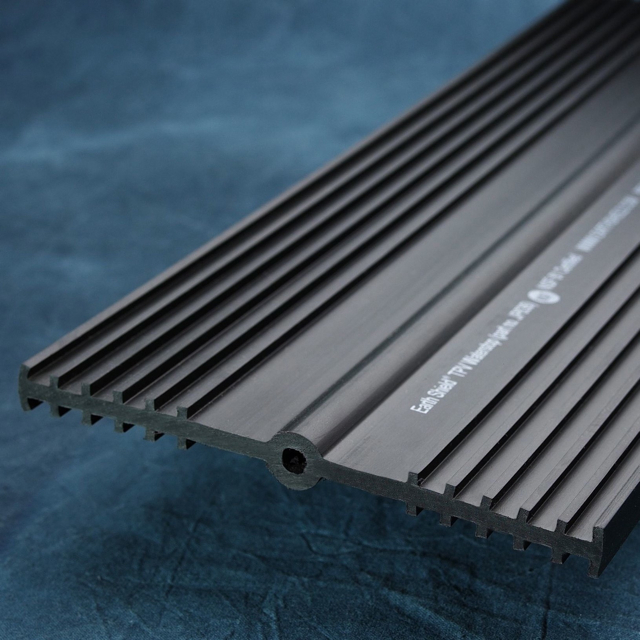 1.Thermoplastic Vulcanizate (TPV) Waterstop shall conform to EPA Title 40 CFR Section 265.193. The suitability of the waterstop for a specific application should be determined by specific testing for that particular requirement per ASTM D471. Project-specific certification to be provided by the manufacturer. 2.Thermoplastic Vulcanizate (TPV) Waterstop shall be independently certified for use in potable water per NSF/ANSI Standard 61. Third-party certified documentation to be provided by the manufacturer. 3.No equals or substitutions allowed.